In what can probably be best described as a moment of weakness, I have embarked on yet another large-scale project, this time the Great American Afghan. When my sister, Alison, and I were in Apple Yarns a few weeks ago Alison was quite taken with the shop’s sample of this blanket, which was made up in blocks of earth-toned colours. It would match her family room perfectly. I suggested that perhaps she should take up knitting again and work through it, square by square, but she thought it would be too difficult a project for her and dismissed the idea. At that she likely forgot all about it but I couldn’t get it off my mind. Maybe we could knit the afghan together, she taking the easier squares and me the more difficult. Or perhaps I could knit it for her and surprise her with it on a suitable occasion, like her birthday or Christmas. Sure, it was a huge investment of time and money but think how much she’d love it. I would just buy the book, I decided, and a few skeins of yarn, and play with it a little, a block here and a block there. I would buy more yarn as needed, bit by bit, not worrying about a specific colour scheme. It didn’t matter if it took months or years to make. For once, I’d go with the flow, let the project unfold as it would over time. You’d think I’d know by now that when it comes to knitting it is utterly impossible for me “go with the flow”. 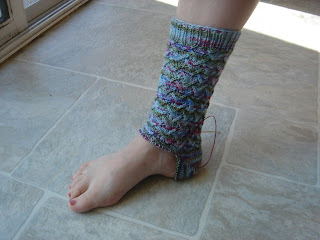 I want my socks to match, I don’t want my hand-dyed yarns to flash or pool, and I am entirely incapable of knitting an afghan without a plan. Having admitted as much to myself after knitting the first square, it was back to the yarn shop to carefully choose the colours, then back home again to plan out each block. I’m still not imposing any time limits on myself, working on it whenever the mood strikes me, but I am secure in the knowledge that it will all match when I am done. So far I’ve completed two squares and am halfway through the third. Each 12”x12” block features a unique design so in a way it is like working on twenty-five small projects, instead of one large one. 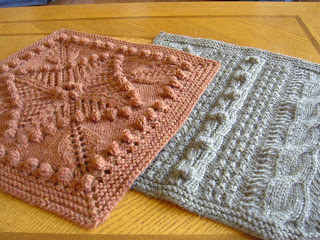 Besides making some progress on my Ella Jacket and YOL shawl, I have finally chosen a pattern for July’s Sockdown. Remember “Monet”? After being returned to the sock yarn stash months ago, it is now in the process of being knit into Crosshatch Lace Socks.